The Diepoldsau, Switzerland site of packaging manufacturer Greiner Packaging International has taken another important step in further developing the K3® packaging technology: as a decoration variant for cup packaging, K3® D is as flexible as sleeves for cup packaging and provides new ways for making dairy products stand out at the POS. In German, the abbreviation K3® stands for Karton-Kunststoff-Kombinationen (cardboard-plastic combinations), and the D stands for the deformability of the cardboard wrap in the third dimension. Kremsmünster / Diepoldsau, 19 March 2014 – Previously, sleeves were the only practical technology for decorating cups with special shapes. There is now an attractive alternative with K3® D from Greiner Packaging International. For the first time, it has become possible to deform a cardboard wrap in the third dimension. With this technology, any desired cup shape with diameters from 68 to 75 mm can be decorated. K3® D combines the advantages of the classic K3® packaging with a high degree of shape flexibility. 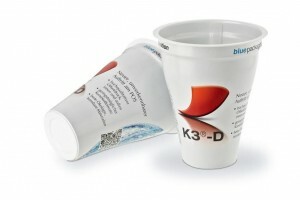 “K3® D provides much more latitude in decorating cup packaging. This will benefit our customers in the dairy industry in particular, because they will be able to stage-manage their products to perfection at the Point of Sale,” says Kenneth Boldog, Head of Division K at Greiner Packaging International. As with classic K3® packaging, K3® D packaging solutions win people over through excellent communicative properties. Your carton wrap can be imprinted on both sides, with up to six colors on each side, through offset printing. The inner side of the cardboard wrap is often used for marketing and communication or additional product information. The surface of the cardboard material feels comfortable and “warm” to the touch. This tactile advantage complements the visual advantages of cups with special shapes. A large portion of K3® packaging is renewable raw material or recycled cardboard. This makes it the number one choice when it comes to sustainability. Its advantages include an excellent CO2 balance, reduced use of plastic, low intrinsic weight, and corresponding energy efficiency during transport. K3® technology has proven itself for years across Europe – in various diameters and shapes, and in the form of multipacks. It has its roots in Switzerland, at the Greiner Packaging site in Diepoldsau, which continues to provide the critical impulse for its further development. Greiner Packaging International is one of the leading enterprises in the European packaging industry. In 2012, the enterprise achieved annual sales of EUR 472.9 million (EUR 488 million, including joint ventures) – more than one third of the Greiner Group’s total sales. Greiner Packaging International has 3,236 employees at 34 locations.